I received a very nice compliment recently. A family member of one of the celebrities who has appeared on Who Do You Think You Are? wrote to me and asked for a print copy of my blog post about that episode. The plan is to share it among immediate family members and with cousins in the future. I think it's wonderful that they liked my post enough to want to have a copy, and even nicer that they took the time and had the courtesy to ask for that copy. Maybe some of the big-name bloggers are used to that type of thing, but I'm still a relative newbie, and it's one of the nicest things someone has said about my blog. It is so easy to fall behind. After Comcast took so long to fix the problem with my On Demand services, I'm still playing catch-up. I finally was able to watch the J. K. Rowling episode of Who Do You Think You Are? again yesterday, on Saturday. Now, of course, I need to rewatch Alfre Woodard and Bryan Cranston before I can write about them, plus there's the new episode with Tom Bergeron tonight, and I haven't seen the "highlights" episode from last season yet . . . . The opening teaser for J. K. Rowling says that she is searching for a family hero and finds a mystery. She also finds drama and discovers a surprising connection to her own life. Almost everyone, including me (who has never read one of the books), knows of J. K. Rowling because of her immensely successful Harry Potter series of books. The books have sold more than 400 million copies and have grown into a movie franchise also. Rowling was once a struggling writer but has become a celebrity. In 2009 France awarded her the Légion d'Honneur for her contributions to world literature. Rowling, who goes by Jo, is a also philanthropist who particularly focuses on social causes relating to children and single-parent families. Rowling, who was born in England, now lives in Scotland with her husband and children. She can't share her success with one family member, however. Her mother died when she had just started writing the first Harry Potter book. She regrets that she never told her mother about the book she was working on. Rowling's mother's maiden name was Volant. She was one quarter French and was very interested in her French roots but didn't have the opportunity to explore them. Rowling's motivation for looking into her French background is really because of the loss of her mother. 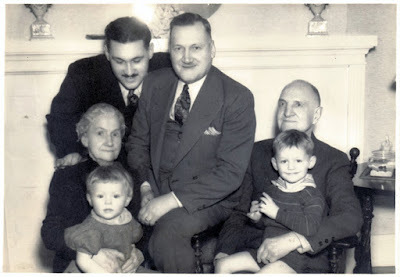 Rowling knows her mother's paternal grandfather was Louis Volant, who married an Englishwoman. He served during World War I and was awarded the Légion d'Honneur. Rowling gave her acceptance speech for her own Légion d'Honneur in French and mentioned Volant. She doesn't know much about him, though, and wants to learn about his family, where he was from, and the generations before him. Rowling begins her search in Edinburgh, where she speaks with her mother's sister, Marian (Volant) Fox. 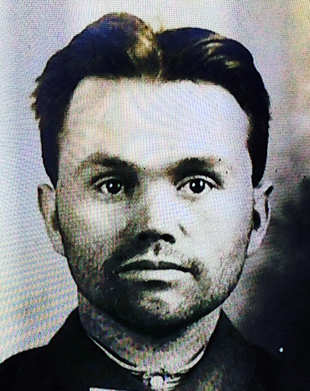 Marian has a photo of "Lou" in his uniform and his good conduct certificate from his national service in France, which shows his birthday as July 31, 1877; Rowling's birthday is also July 31. 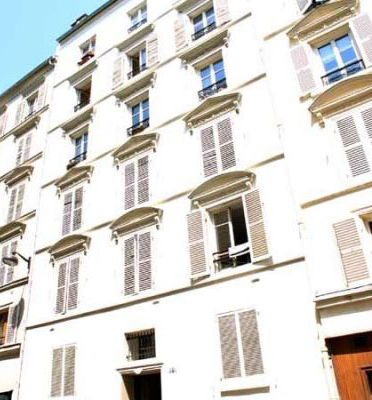 The certificate also says that Volant was born in Paris in the 10th arrondissement. In addition, Marian has a photo of Louis' mother, Salomé Schuch. Schuch grew up in the country. Volant immigrated to England in the 1890's and then moved to London, where he worked as a waiter. There he met Lizzy, his future wife, while she was working as a nursery maid. Marian has love letters that Volant wrote to Lizzy while he was back in France for his national service. The two women read one of the letters, which was very sweet. Volant was very much in love. There's also a wedding photo, which Marian thinks was from about 1898 (but from looking at the FreeBMD site, I think I found the marriage, for Eliza Mary Smith and Louis Volant, which was registered in the first quarter of 1900, so it could have taken place in 1899). The marriage did not last, as Volant wanted to return to France but Lizzy wouldn't go with him. They didn't divorce, however, and they continued to correspond for 50 years. Marian regrets that they only have half of the letters (the ones from Volant). Lastly Rowling and Marian look at Volant's World War I identification card and something that Marian calls his Légion d'Honneur badge, which is in a case with "L. V." on the lid. She says that they don't have the medal, and there is no citation to go with it. I could read "Étoile d'Honneur" on the badge, which is not the same as "Légion d'Honneur." Aunt Marian gives everything to Rowling so that she can take it with her as she does her "research." Since Paris was the only French location mentioned, that's where Rowling heads next. On the train she reads a postcard Volant wrote to his family in England on June 23, 1915. He was 37 years old and at war. She comments that he was "quite old" for war. She also looks at Volant's military ID card, which is dated February 19, 1916, has his service number (#782), and says that he was an interpreter. Rowling first goes to the Archives Nationales, which we are told is where the government holds the most important documents of France, and the records of every awardee of the Légion d'Honneur. There she meets with Claire Béchu, the deputy director of the archives. (I'm sure if you went, you would be able to meet with her also . . . .) Béchu has already pulled the dossier of Louis Volant. He was injured at Fort de Vaux, near Verdun. His file indicates that he lost a limb and that he was born July 16, 1878 in Ordonnaz. Rowling starts to figure out that maybe this isn't her ancestor. She finally tells Béchu, "This is not my Louis." He was certainly a brave soldier, but he has the wrong birth date and birth place and different handwriting. (Plus we haven't heard any story about her great-grandfather having lost a limb.) Rowling asks whether there could be another Louis Volant, but Béchu tells her this is the only one in the database. So where did the family story come from that Volant had earned the Légion d'Honneur? Was it a deliberate deception or an innocent mistake? And what happened to Rowling's Louis Volant during the war? Rowling thinks her mother would want to know the truth. From the Archives Nationales Rowling now goes to the Château de Vincennes on the outskirts of Paris, which has records for all the French armed forces, dating back more than 400 years (pretty impressive!). Captain Ivan Cadeau, a French military historian (whose specialties are actually the French army in World War II, the war in French Indochina, and the Korean War), is there to greet her. Rowling shows him the "Légion d'Honneur" badge in the case and says that she isn't sure if that's what it is, because she doesn't have anything that looks like it. He tells her that the badge is not military at all, but is a Society of Trade Unions award. He's very apologetic, but Rowling takes it in stride. Cadeau then explains that there were in fact two Louis Volants who served in World War I. One was a lieutenant; he earned the Légion d'Honneur. The second had a file number of 782, which matches what Rowling has, so it's the right person. The final confirmation is that his birthday was July 31, 1877. Rowling tells Cadeau that July 31 is her birthday also, but he doesn't seem to notice. Rowling's Louis Volant was a corporal in the 16th Territorial Regiment. Territorial regiments were composed of soldiers who were 35–40 years old (although the French Wikipedia page says they were 34–49). They were not fighting units but were intended to guard highways, roads, and bridges. The men had only fifteen days of training before they were sent out. Volant's unit was in Courcelles-le-Comte in October 1914, where a large battle took place. The narrator steps in at this point to explain that at the outbreak of World War I, the Germans launched a surprise attack on France in the hope of being able to capture Paris and have a fast victory in the war. They faced fierce opposition, however, and were pushed back to the northeast. On October 3, 1914, they attempted to outmaneuver the French at Courcelles-le-Comte, which was guarded by the 16th Territorials, including 37-year-old Corporal Louis Volant. Cadeau has the regimental diary of the 16th Territorials. (This is an OCR-scanned history of the 16th Territorials during World War I, but Volant's name does not appear in it.) Rowling appears very comfortable reading directly from the French. Bombing began at 4:30 a.m. Territorial regiments had no artillery, only rifles, so they had no defense against the shelling. At 9:00 a.m. the cannon fire became more intense. Most of the officers were killed or injured. After five days of bombardment, the constant gunfire and heavy damage had demoralized the men in the unit, but the 16th courageously held on until October 25. Volant's service record has more details: He took command after the officers were gone and himself killed many Germans. He was seriously wounded in the arm and side by a shell. This was his only battle; after he recovered from his injury he worked as an interpreter (ergo the ID card from 1916). Rowling is very impressed by her grandfather's bravery in the bloody battle. There's still a lot she doesn't know about him, though, such as his early life and information about his parents. She knows his mother was Salomé Schuch, but that's all. She goes next to the Assistance Publique Hôpitaux de Paris Service des Archives (roughly translated as the Paris Hospital Archives), which the narrator tells us has all the birth records for the city. She says she has asked Ancestry.com genealogist Carène Tardy to help her with her search. Tardy immediately sits her down to search on a computer (but they don't use Ancestry!). She finds the record for Louis, born July 31, 1877, but the only parent listed is his mother, Salomé Schuch, who was a 23-year-old servant. (The exact same database they use is available for free online. Louis' birth registration is here, on page 17; it is the middle one on the left page.) No father's name appears in the record, so Louis Schuch was illegitimate. Tardy asks if Rowling wants to look for the legitimization of Louis' birth. The narrator pops in to say that under 19th-century French law, the mother had to acknowledge an illegitimate child in order to keep him. And yes, Salomé did say that she recognized Louis as her natural (i.e., illegimate) son, but still did not list a father. 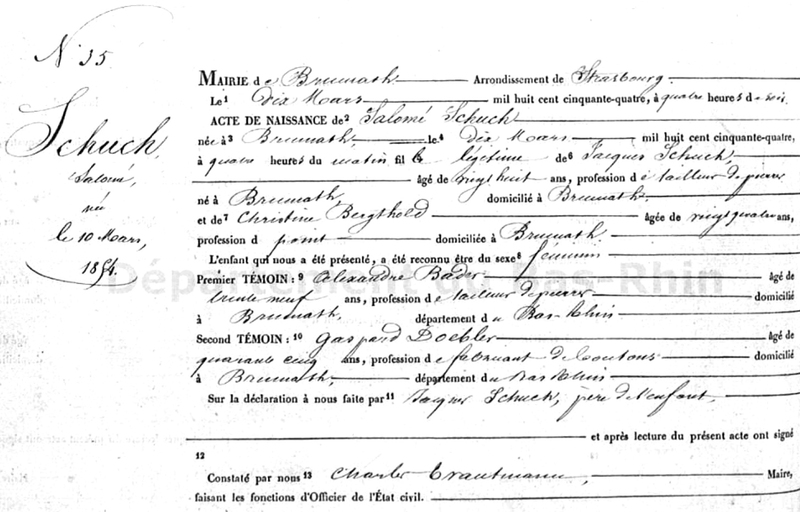 (Louis' birth registration at the link above includes a notation about Salome's acknowledgement, at the top left of his record, just under the name "Schuch"; the fact that Louis was made legitimate by his mother's marriage to Pierre Volant in 1883, in the middle left; and a notation about Louis' death on September 17, 1949, at the bottom left.) The record includes Salomé's signature, which catches Rowling's attention. It is not stated, but Salomé must have been literate. 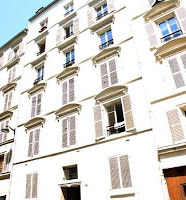 Salomé's address was 19 rue Clauzel (which on Google Maps currently appears to be undergoing some sort of construction work). Tardy suggests that Rowling look for the house to know where she used to live. Of course Rowling goes to the building, hoping to learn more about Salome's life as a servant, and the narrator says that she has arranged to meet author and French historian Marlo Johnston (who is British and specializes in Guy de Maupassant) there. Johnston greets her outside and they enter the building. As the two women climb the stairs higher and higher, Johnston tells Rowling that Salome's duties as a maid would have been cooking, cleaning, and fetching and carrying coal and water, all hard physical work. Salomé would have come down in the morning to work and gone back upstairs at night to sleep, and that would have been her entire day. (Well, she obviously found time for something else, because she became pregnant. Maybe the father worked in the house also?) They reach the top floor (I believe it was the fifth), where the servants lived. Their rooms were tiny, each having only a cot and possibly a wash basin (though they didn't actually open any of the doors). The conversation next turns to Salome's pregnancy, which she would have had to conceal. If it had been discovered, she probably would have been dismissed before the baby was born. No public assistance existed at the time, so she had no place to turn. After leaving the hospital with the baby, she would have had no support. Her only option would have been to ask the church for help. We have to assume that researchers did not find anything about how she survived after Louis' birth, or it would have been mentioned. After walking back down all those flights of stairs (I thought I saw some people a couple of floors below them), Rowling and Johnston sit somewhere (possibly a café?) and discuss the additional information Johnson found during her research. 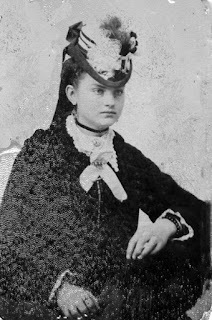 She says that eighteen (not really, only seventeen) months after Louis' birth, Salomé had moved from rue Clauzel to rue Milton and had another son, Gabriel Jean Volant, born in December 1878. 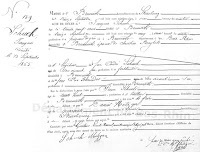 The birth record does list a father this time, Pierre Volant, but says that the parents were not married. They were living together, and Volant acknowledged that Gabriel was his son. This time Salomé was a dressmaker (cotourière), so things were improving: better job, living with her chid's father, and his acknowledgement of the birth. As she leaves, Rowling talks about her fascinating day. Her great-great-grandmother had been in dire straits as a penniless single mother, but it was clear she had been a survivor. She sees parallels with her own life, because 20 years ago, she was teaching and just starting to write and was very poor, and then became a single mother herself. As the next step, the narrator says that "Jo has decided to travel" to Brumath (I'm still waiting for a celebrity to say no), a mere 10 miles from the German border. She goes to the town hall (Hotel de Ville) and speaks with Stéphanie Fischer (there's another German name for you), the "Company Secretary" (administrator) of the mayor's office (or at least she was when this was shot, apparently no later than November 2013, because that's the month she started working in Lauterbourg). They go back and forth about the pronunciation of the name Schuch. After having been in Paris, Rowling is saying it as "shoosh", the French way, while Fischer corrects her with the German pronunciation, close to "shookh." 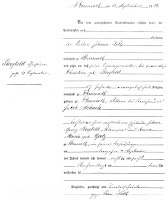 Fischer has Salomé's March 10, 1854 birth "certificate" (really a registration), listing her parents as Jacques Schuch and Christine Bergthold. Rowling is surprised at another German surname, and Fischer explains that many people in Brumath have ancestors from Germany and even Switzerland. 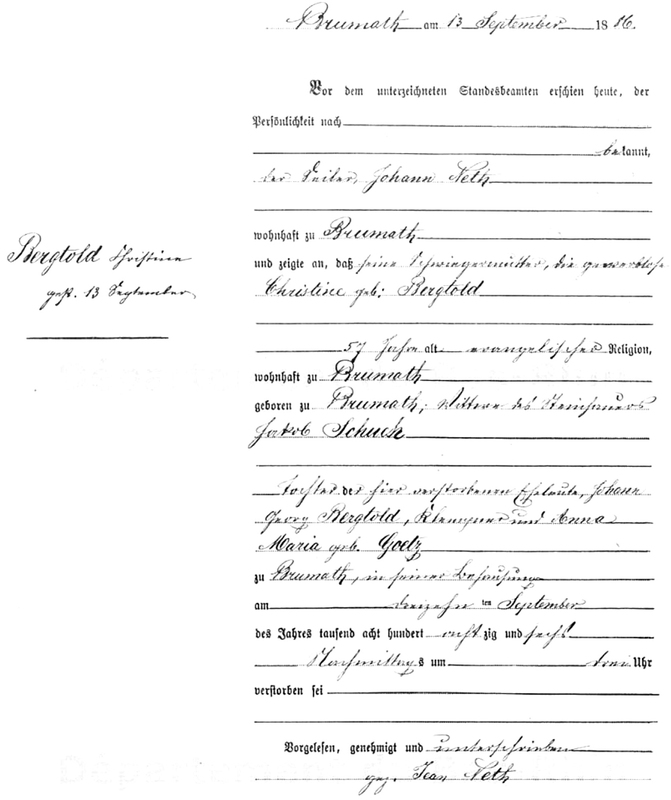 Fischer brings out copies of pages from the 1861 census that show the Schuch family. We don't get to see Jacques and Christine's ages, but the family has five daughters: Catherine, 13; Salomé, 8; Marguerite, 6; Dorothée, 3; and Christine, 1. Rowling doesn't understand what Jacques' occupation is, and Fischer tells her he was a tailleur de pierre, or a stone cutter, not a well paying job. As an afterthought, Fischer mentions sandstone. 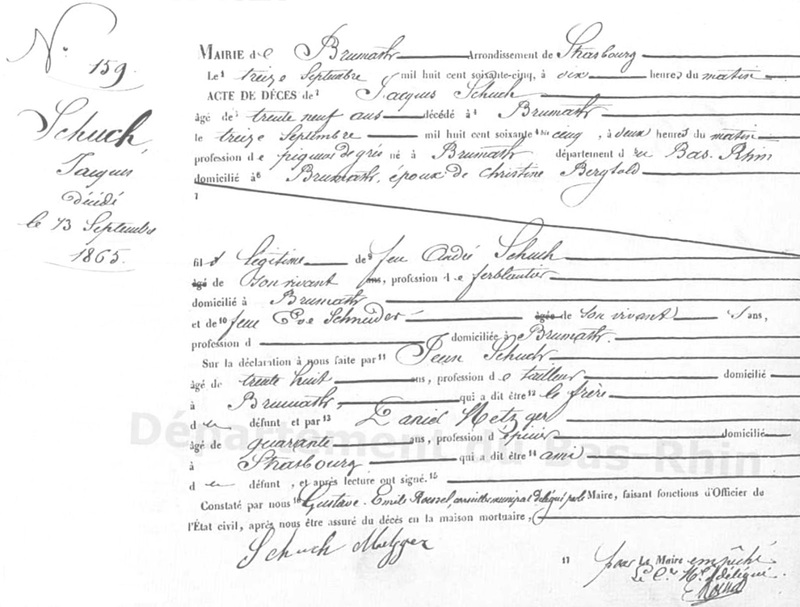 (Jacques is indeed listed as a tailleur de pierre on Salomé's 1954 birth registration, but on the census it says piqueur de grès de ménage, indicating specifically that he worked with sandstone.) The family was poor. They had another daughter later in 1861, Madelene. The next discovery is a sad one: Jacques died on September 13, 1865 at the age of 39. (His death record also lists his profession as a piqueur de grès.) Rowling comments that "Salomé lost her father when she was 12" (but by my arithmetic, since Salomé was born in 1854, she was only 11). To compound Christine's problems, she then had a son, Jacques, born a month after his father had died, on October 27. Rowling comments that Christine was "a widow presumably in her 30's" (but I don't understand why she says "presumably", when she should have been able to see Christine's age on the 1861 census, even if we couldn't), without a job. Then we learn that Christine died on September 13, 1886 (coincidentally, the same day on which Jacques died twenty-one years earlier); Rowling says that this at least was "not a premature death" (but if Christine was in her 30's in 1865, then she would have been in her 50's in 1886, which sounds a little young to me, and she is indeed listed as 57 years old in the death record). On a practical level, I'm wondering how a woman without a job who was widowed in 1865 managed to keep everything going another 20+ years. The informant on her death certificate was her son-in-law, so maybe his income was what actually ensured the family's survival. As she leaves Fischer, Rowling is struck by the growing theme of women holding their families together. She is now up to four: herself, Lizzy, Salomé, and Christine, who was a widow in her 30's with seven children. She also wants to learn more about the sudden change from French to German control in Brumath and wonders what happened to her family during that time. This normal town life ended in July 1870, when France declared war on Prussia. The narrator pops in to tell us that Alsace had been part of France for 300 years, but the Prussian prime minister, Otto von Bismarck, had decided he wanted it back. On August 6 he launched the Battle of Woerth (Wörth in German), only one day's march from Brumath. Sigrist tells Rowling that 80,000 German and 45,000 French soldiers fought in the battle, one of the bloodiest battles in the war. He adds that 20,000 "people" (does he really mean men, as in the soldiers?) died. The French army was divided in two, with one part going south to Brumath on its way to Strasbourg. Sigrist has a copy of Geschichtliche Notizen über die Stadt Brumath ("Historical Notes on the Town of Brumath"), which includes a description of the battle written by the mayor of Brumath. He has a translated section for Rowling which details the arrival of soldiers into the town. First infantry and cavalry troops fleeing the French army came into the town. Salomé's family would have seen these men pasing under their house windows. On Monday, August 8, several German regiments arrived, and on Tuesday 18,000 German soldiers essentially invaded. At this point, normal life stopped for Salomé and her family. She would no longer have gone to school, and the family couldn't go out of the house. They would have had no choice but to give anything they had to the soldiers. Rowling is struck by how Salomé has suffered trauma after trauma. 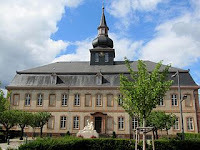 Her father died, and then after a "brief period of security" (heaven knows when that was, with a widowed mother and six other siblings) the town was taken over by Germans. (It sounds like Rowling is overdramatizing things, but perhaps she was told more information that was cut in editing.) No one knew what would happen after the war. Sigrist relates more about the war. The fate of Brumath depending on the defense of Strasbourg, the capital of Alsace, which was held by the remaining French army. Using Brumath as their base, however, the German forces besieged Strasbourg for six weeks. Almost 200,000 artillery shells were fired, which killed thousands of men, women, and children. Many German soldiers who died during the siege were buried in Brumath. The end of the siege came on September 27, 1870, with the Germans victorious, and the French citizens wondering what would happen. On October 8, the announcement was made that "Strasburg ist und bleibt deutsch" ("Strasbourg is and will remain German"). So on October 8 did the Schuch family effectively become German? Sigrist says he is not sure; the Treaty of Frankfurt (which officially ended the Franco-Prussian War) allowed people to choose between remaining French citizens or becoming German. (Per the Wikipedia page, they had until October 1, 1872 to decide.) The catch was that those who chose to remain French had to leave and go to what was then France. The only way to learn whether Rowling's family members opted to remain French is to look for their names in the lists. Now Rowling is a little flummoxed. She started out looking for her French roots, but maybe her family became German. She hopes they stayed French, but it might have been too much to hope for, as they were on the verge of poverty (and where did that information come from?). Of course, she is going to try to find documents that will let her know. Rowling now visits the Protestant (Lutheran) church in Brumath, where genealogist Prof. Guy Dirheimer greets her (I guess he does genealogy as a sideline from his professional career in pharmacy). 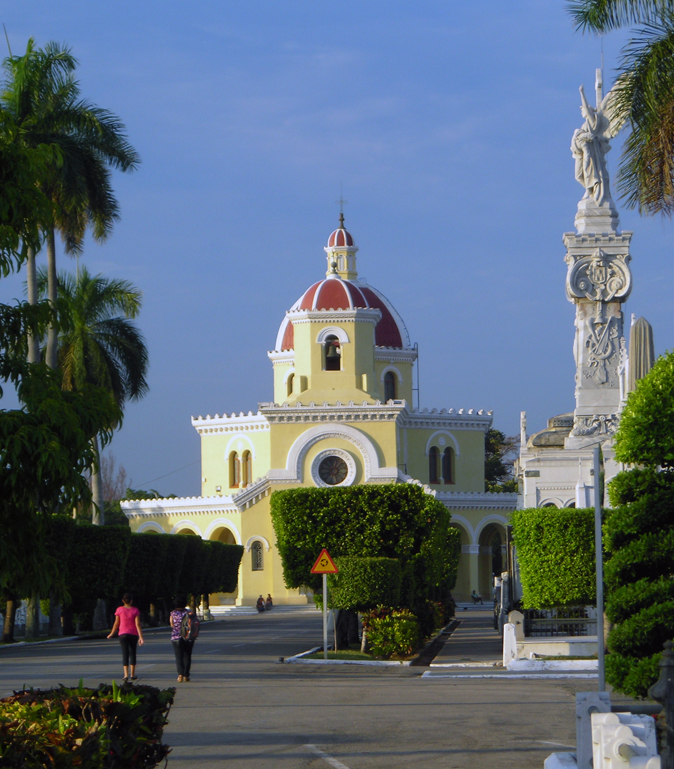 He tells her that this is the church where her family members were married and baptized. He looked for names of Brumath residents who left but did not find Christine Schuch. Rowling says she can understand why Christine would not have uprooted herself at that point and that it would have been almost foolish for her to do so, but wonders about Salomé. Dirheimer explains that Salomé couldn't opt to remain a French citizen because she was underage at only 17 years old; the age of majority was 21. Dirheimer did find another family member, however. 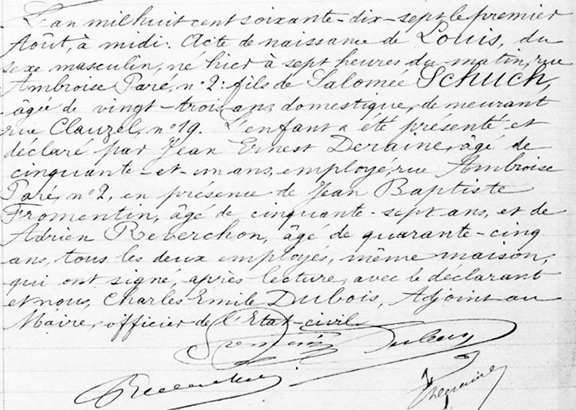 Salomé's great-aunt, Catherine Bergtold (the widow of Lobstein, according to the page we see on screen), officially chose to remain French on September 9, 1872 in Paris. Because it's known that Salomé ended up in Paris, it's likely that she went with her aunt. But then it occurs to Rowling to ask if Salomé was still technically German, even though she was living in Paris (a very good question). Dirheimer tells her that it depends and asks if she married. When Rowling says that she married Pierre Volant, a Frenchman, Dirheimer explains that she would have become French by marrying Volant, by French law. So Salomé was born French, was German for about 10 years (at bayonet point, so it didn't really count), then became French (again) via her marriage. As a storyteller, Rowling finds Salomé to be the person who stands out in the family history she has learned. She lived through difficult times, held her family together, and built a stable life (again, where did that come from?). Rowling is glad that she found the truth and believes that her mother would have adored every minute of the journey. 1) Do you have a Web site or a blog? Or know someone with one? Pick yours, theirs, or another. 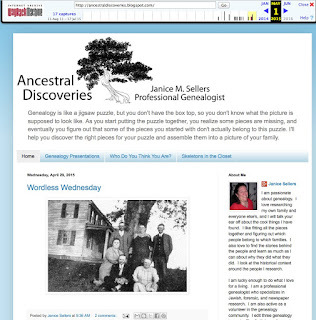 2) Now go to the Wayback Machine (https://web.archive.org/web/) and put the Web site address in the search field. 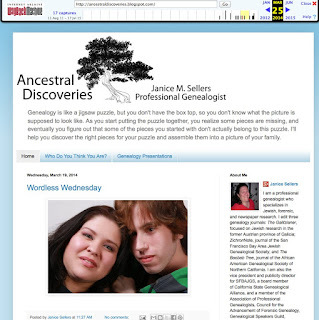 Explore — see what the Web site looked like over time — start with the first available archived date and select others over the lifetime of the Web site. Make some screen shots to show your readers. 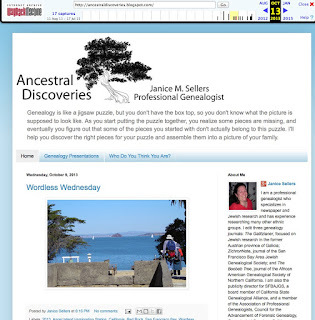 3) Share your Wayback adventure with us in your own blog post or in a Facebook or Google+ post. Be sure to leave a link in a comment on this blog. Like Randy, I am also somewhat a creature of habit, in that I haven't changed my layout or theme since the beginning. I changed the blog description sometime between August 2011 and April 2012, and since then it has stayed the same. The biggest difference has been the "About Me" write-up, which seems to be different on every capture. 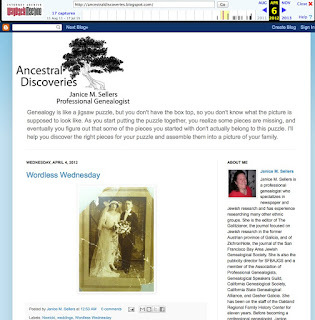 I was surprised to see that ten of the Wayback captures showed a "Wordless Wednesday" post on top, even when the captures were on other days of the week. Maybe the spiders like photographs? General John J. "Black Jack" Pershing is remembered today primarily for his military successes, but his greatest loss came not on a battlefield but at home. In 1913 Pershing took command of the 8th Brigade at the Presidio in San Francisco. He and his family — his wife, Frances, and their children — moved there. Early in 1914, however, Pershing was deployed to Fort Bliss, Texas due to border problems between the United States and Mexico. After almost a year in Texas, Pershing decided to bring his family out there. Arrangements had not yet been completed when a fire struck the Pershing home on the Presidio, on August 27, 1915. 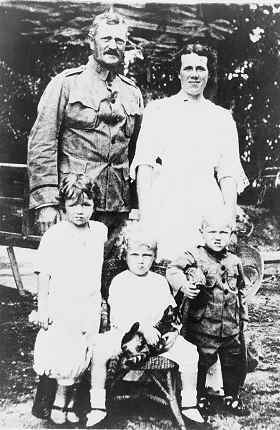 Frances Pershing and the three Pershing daughters, Helen, 9, Anne, 7, and Mary, 3, died in the fire. Only Pershing's son, Warren, 6, survived. Thursday, August 27, 2015, was the 100th anniversary of the fire and the Pershing deaths. A memorial event was held at Pershing Square at the Presidio in honor of General Pershing's loss. About 60 people attended the ceremony. After the laying of wreaths at the site and a moment of silence, additional presentations took place in the Presidio Officers' Club. The most significant in context of the memorial was that of Major General Alfred Valenzuela, U.S. Army (retired), who spoke about how important families are to members of the military. Support from family members helps service members make it through the often difficult work they do to protect and serve our country. A timely discovery at the memorial ceremony was that the ongoing Presidio archaeological project recently found what is believed to be part of the foundation of the Pershing home. The event was organized by the World War One Historical Association working with the World War One Centennial Commission, the Pershing Rifles, WorldWar1.com, the Presidio Trust, and the National Park Service. Additional support came from the American Battle Monuments Commission, the office of the Honorable Nancy Pelosi, U.S. House of Representatives, and the ROTC Santa Clara Color Guard. 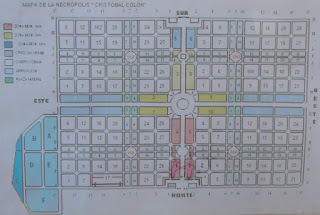 During my recent trip to Cuba, I visited the large Necrópolis Cristóbal Colón (Christopher Columbus Cemetery). Just inside the entrance was a display celebrating the 143rd anniversary of the cemetery, which opened October 30, 1871 (so the display probably was put up last year). I figured this information would be difficult to find outside of Cuba, so I've translated the text to share it with others. I have arranged the short essays into a rough chronological order of the events described, which is different from the order in which they were displayed. Please forgive the light reflections on some of the images; the display was all under glass, and I'm not a professional photographer. 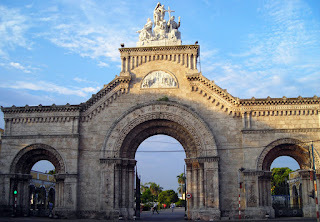 In 1806 Havana’s first general cemetery, known as the Espada Cemetery in honor of Bishop Juan José Diaz de Espada Fernández y Landa, one of its primary supporters, opened its doors. This cemetery ended the dangerous practice of burials in churches and convents. 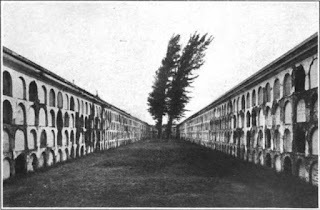 In the mid-19th century, gradual population growth and deteriorating hygiene and sanitation led to successive epidemics, exhausting the burial space available and making it necessary to build a much larger and more modern cemetery. The Espada Cemetery was closed in 1878 and demolished in 1908. 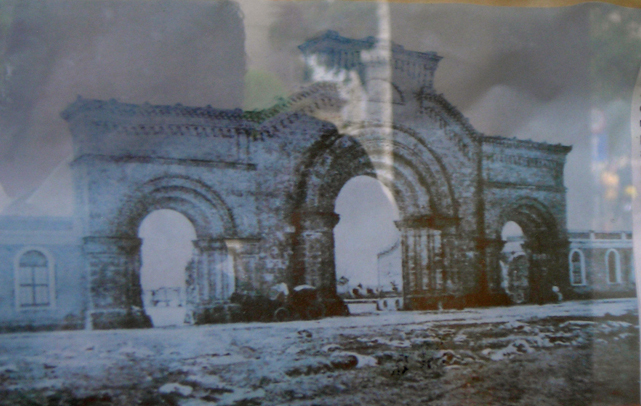 On October 30, 1871, the new city cemetery was opened. 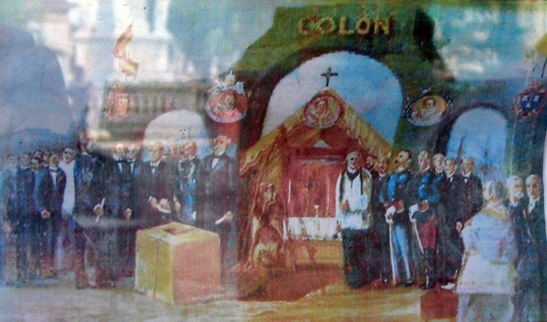 The event was recorded in an anonymous painting portraying what happened at the ceremony, with the benediction, and which included depositing into the first stone a copy of the day's newspaper and some coins. Majestic sculpture designed by the architects Calixto de Loira and Eugenio Rayneri. Almost 22 meters high and built of stone from Jaimanitas [a suburb of Havana]. It is inspired by the classic Roman "Gates of Triumph", showing a predominance of the popular Romanesque style in its arches and the massiveness of its walls. Note that the sculptures were not yet placed. First large mortuary that was built in the cemetery for the burial of the dead, using a system of recesses; these functions ceased in 1874 due to defects in the construction. 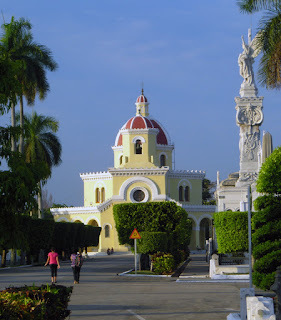 In the 1970’s it was reclaimed to be used as a state-owned ossuary. It is an extensive catacomb, 95 meters long, with 526 recesses in three rows. The name of the gallery was taken from a biblical character of the Naphtali tribe who was devoted to various works of charity, including transporting and burying the dead, in the 7th century BC [8th century BC, according to the Wikipedia article]. In 1886 work was completed on the new cemetery. In the chapel Christian ceremonies are conducted. This chapel marks the center of the cemetery, at the junction of the main avenues. 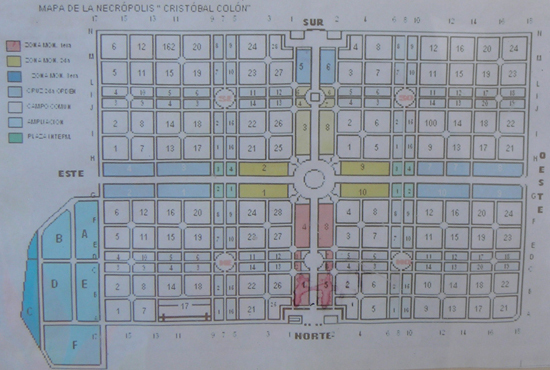 Of a marked necromantic character, it is the only religious building in Cuba with an octagonal plan. View from the central chapel of the cemetery toward the main entrance. This represents the upper-class area, where one sees an abundance of elegant monuments. Note how the cemetery was growing like a city, in line with the interests of the owners. The hierarchy of the spaces was determined in the sales of the plots in order to build tombs according to prices established for social classes. Crowning the main arch, above the inscription JANUA SUM PACIS (“I am the Gate of Peace”), stands a sculpture in Carrara marble, representing the three theological virtues (Faith, Hope, and Charity), by Cuban sculptor José Villalta y Saavedra. It was put in place in 1904. At the same time two other works by the same sculptor were placed on the north and south faces of the main arch. They represent two biblical passages. 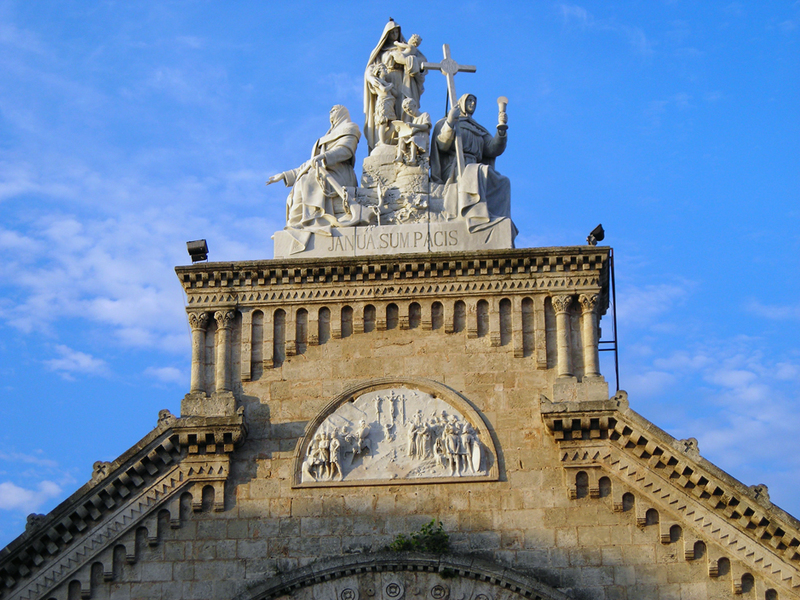 On the outside is "The Crucifixion" [visible in this photo], and inside is "The Resurrection of Lazarus." 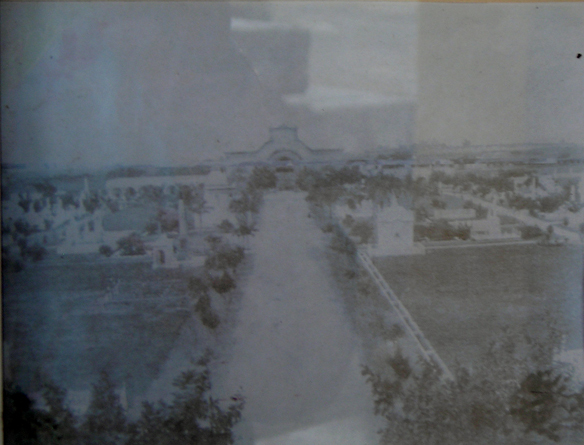 In 1922, a project was drawn up to expand the cemetery through its eastern section, incorporating areas that are called A, B, C, D, E, and F, raising the overall area to 560,000 square meters [almost 140 acres]. The last two blocks of the cemetery to the west were a space for burial of non-Catholics and victims of epidemics. After the construction of the Chinese and Baptist cemeteries, as well as improvements in hygiene and sanitation, the space had no purpose and was transformed in the late 1940’s. 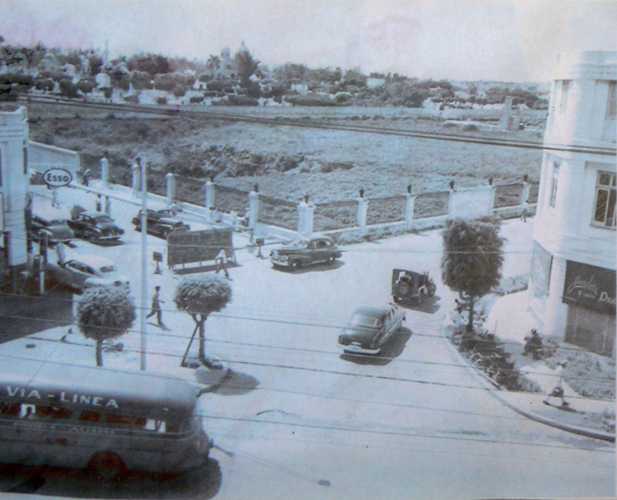 In 1987 the cemetery was declared a national monument, due to its indisputable historical value, heritage, and treasured documents in its archives. In the cemetery expressions of religion and of Cuban popular and traditional culture coexist. It has an extensive collection of architectural and sculptural works and decorative arts, true examples of national and universal culture. Inside one can find prominent individuals of national and international importance. I am finally out of Comcast limbo! I realize few people will be shocked that my Comcast problem was not resolved with the first technician's visit. A tech did come on August 7 as promised, and he actually fixed the problem — but the fix only lasted while he was here. After he left, OnDemand and the program guide were screwed up again. 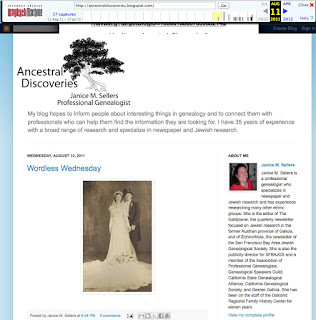 Because I spent last week in Washington at the Northwest Genealogy Conference, the next day I could schedule a follow-up appointment was today, August 17. My programming is working and I was able to watch the Ginnifer Goodwin episode again, but now I'm afraid to turn the TV off. Seasons for series on cable television don't work the same as those for regular networks. Season 3 of Who Do You Think You Are? wrapped up at the end of April, and only three months later Season 4 began. In addition to these two seasons being so close together, the number of episodes varies quite a bit. Season 3 had eight episodes; the original announced schedule for Season 4 had only five, and one of those is a recut of a British original. Since then a "highlights and outtakes" episode was added, which aired August 16. I'm sure some factors in the scheduling are how long research takes for a given celebrity and what they are able to find, but it's hard to plan ahead for watching. Season 4 opened with Ginnifer Goodwin. The teaser told us she would investigate dark family mysteries, uncover a shocking truth, and learn about her great-grandparents who had been shunned for generations. Fun stuff, huh? Goodwin has a one-year-old son named Oliver (born one month after his parents married, by the way). After having a child, it became important to her to be able to give him his family story. She knows three branches of her family well, but not her paternal grandfather's side. John Barton Goodwin died when she was only a year old. She knows he left home at the age of 11 to get away from his family, but that's it. One photo of John Goodwin shows him in a Navy uniform, but his military service isn't discussed. Goodwin is very close to her father and wants to let him know about his father's family. Goodwin starts her research with a visit from her father, Tim, who comes to her home and brings a few things with him. He tells her to find "whatever", even if it's dark (foreshadowing! and they really expect us to believe they don't know ahead of time what the research results are?). Tim didn't really start to wonder about his father until after he died. Tim knows John was born about 1905 in Arkansas and that by age 11 he was living in Memphis, abandoned. His parents were apparently around the area, but he was alone. He spent some time in a juvenile home, but those homes at that time often functioned as orphanages as well as homes for kids in trouble. Tim learned this information from his mother, not his father. Tim has his grandparents' names, John A. Goodwin and Nellie Barton. Tim's father, John, built his mother a home after he was successful but refused to allow her to be part of the family (which sounds very harsh). Tim has a photo of three women; he says Nellie is in the center, but he doesn't know who the other two are. Nellie looks elderly, and the other women are younger (rough age estimates could possibly make them Nellie's daughter and granddaughter). Tim had already started digging and has a copy of the 1910 census for Batesville, Arkansas (on an oversized piece of paper, no less). Al was 29, Nellie 28, a daughter named Pearl was 8, and John was 4. Goodwin notes that Al and Nellie had been married 6 years, but Pearl was 8. Either Nellie was married previously, or the baby came before the marriage ceremony. (She's pretty good with that census, isn't she? Has she done this before? She didn't mention, however, that the census indicates it was a first marriage for each of them.) All of them were born in Arkansas, as were their parents, so Goodwin says she should probably go to get records in Arkansas. (Seriously?) Tim says there are "so many things I could have asked him that I regret not asking him", which should serve as a great reminder to everyone else to ask your older relatives questions now, while they are alive. In the interlude, Goodwin says that as a mother, she wouldn't let her 11-year-old child out of her sight, so she wonders what happened. Now she's heading to Batesville, where her grandfather lived with his parents, to look for some answers. Goodwin is now baffled and overwhelmed. She wonders if there was a "gross, extensive misunderstanding" or if her grandfather didn't want people to know who Nellie was and told family members an incorrect maiden name to make her untraceable (which didn't work anyway, as we can see). But now she's on Nellie's trail and wants to learn all she can, whether it's good or bad. Will the divorce decree shed some light on this? At the Independence County courthouse, Melissa Murray, a law professor at the University of California at Berkeley who specializes in family law, greets Goodwin. She has found Nellie Williams' divorce case against Duff J. Williams, which was filed on October 19, 1903. Nellie stated that she and Williams were married on October 3, 1900 (only three years later, and she's already off by one day!) and that Williams had deserted her December 17, 1900, leaving her with a baby girl who was 8 months old (which means born before the marriage, at least by my calculations). The baby was probably Pearl. The fact that Nellie didn't file until 1903 prompts Goodwin to ask why she would wait that long. Murray explains that in that era women's economic support and security depended on marriage or parents. She says that maybe Nellie wanted to stay married but finally decided Williams wasn't coming back, or maybe she had met a new man, e.g., Al Goodwin, and needed the divorce to be able to marry again. 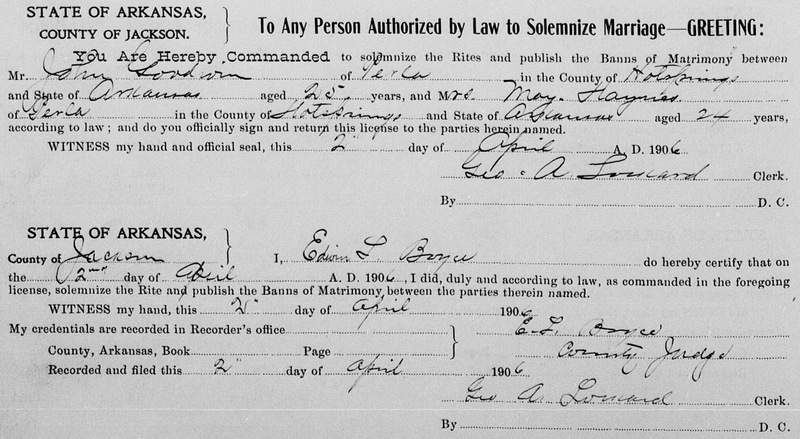 The two women don't discuss the resolution of the divorce suit, but the front of the docket shows that the case was "disposed of" on May 11, 1904. Other tidbits from Nellie's claim that weren't talked about on air but were easy to read in the screen shots of the documents were that Nellie and Williams were married by Judge J. D. Fulkerson, circuit judge, at the courthouse, and the words "arrested", "penitentiary", and "18 months imprisoned", presumably referring to Williams (which suggest that perhaps part of the reason he "deserted" her was because he was in prison?). Perhaps the latter weren't considered relevant to the discussion because they were trying to surprise viewers with what was to come later? Goodwin asks where she should go now. Murray suggests the Arkansas History Commission, where her colleague, Brooks Blevins, can help her with the wonderful archive there. Goodwin says she now has a more neutral view of Nellie, after learning that she was abandoned and poor. She doesn't know yet how her great-grandfather fits in; she assumes he was Nellie's knight in shining armor. The Arkansas History Commission is in Little Rock. Brooks Blevins, Ph.D., is there with a stack of legal records to show Goodwin. All appear to be indictments against Al for selling liquor without a license; he was a bootlegger. The first one shown is from June 1906 for an infraction in spring of 1906, so Goodwin's grandfather would have been only about one year old. All were filed by 1910. The two discuss that Nellie would have known that this was happening. It was a way to make a good living, however, and she might have supported it. Blevins has a newspaper article from the December 23, 1910 Batesville Guard showing that Al was in jail and waiting for trial. This was well before Prohibition, so he wasn't being prosecuted for selling alcohol, but for failure to pay taxes on controlled items. Goodwin jumps to the conclusion that he wasn't paying taxes on his income, but the government apparently was not collecting taxes from 1906–1910, since the Income Tax of 1894 was apparently ruled unconstitutional, and the 16th Amendment wasn't ratified until 1913. (Oh, and the name IRS, which Blevins uses, didn't come about until 1918.) Blevins apologizes for not being able to find Al's federal trial records but tells Goodwin that some National Archives branches have records from federal prisons. Blevins mentioned the federal prison records because he found Al's, of course. He hands Goodwin a file folder. When she opens it and looks inside, she says, "Oh, wow," and pauses, then adds, "That's wild." (That is such an odd comment, but maybe that means it was her honest reaction?) She holds her head and has a pained, pensive look on her face. She then holds up a mugshot of Al, who was apparently prisoner #3261. Goodwin wonders if anyone in her family would have seen a photo of Al. The file is dated January 11, 1907, though Al appears to have entered prison ("date of reception") on January 17, 1911. He was 29 years old. Goodwin pages through the file and picks up a sheet of paper labeled "Evidence of Previous or Present Disease." Listed are pneumonia in 1901, syphilis in 1906, measles in 1907, mumps in 1910, and "Gonorrhea twice last 1910" (a charming fellow). At the bottom is a note that Al's paternal grandparents and his father died of consumption (tuberculosis). The only disease Goodwin mentions is the syphilis (which ends up being foreshadowing, but any others mentioned may have been cut in editing). Goodwin asks what happened to Nellie after the divorce. Blevins refers her to his colleague, Brian Schellenberg, in Little Rock and says that Schellenberg can "walk [her] through some of the genealogy trails." Gee, it sounds like they're going camping! (And just like Duff Williams, nothing else is mentioned about Al or his fate for the rest of the episode.) As Goodwin leaves, she talks about how emotional she was when she saw the photograph of Al but sounds frustrated about the "endlessly bad choices" that Nellie made. Schellenberg tells Goodwin that Minden is in northern Louisiana, near Shreveport. From that, somehow Goodwin comes up with the question of whether there might be more information in Shreveport. (Why not ask if there's more information in Minden? Because she did that and he told her no, and they edited that out?) Yup, that's the next stop on the Nellie Haynes research tour. Schellenberg wishes Goodwin good luck as she leaves. Louisiana has come as a huge surprise to Goodwin, but she definitely wants to find out what was going on. As she arrives in Shreveport, Goodwin has much less sympathy for Nellie. She doesn't understand why Nellie was in Louisiana when her son was in another state. Earlier she had assumed that Nellie just had bad taste in men, but now she's beginning to believe that Nellie was a bad seed herself. 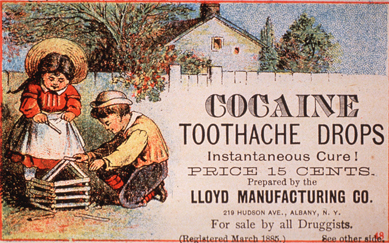 The narrator, who didn't have much of substance to add during this episode, explains that during the early 20th century several drugs that are now controlled — morphine, cocaine, heroine — were legal and accessible, used for many everyday ailments, and hundreds of thousands of people became addicted. The Harrison Act placed some of these drugs under federal supervision, which meant that doctors were restricted in what they could prescribe, but drug dealers still sold stuff to desperate addicts. But is this Hugh truly linked to Goodwin's Nellie? Spillane says while looking in the newspapers for Hugh Wyllie he found one reference to Mrs. Hugh Wyllie. Goodwin says, "Excellent," and then Spillane gives her a copy of the article. Goodwin doesn't say anything but appears to be holding back tears, because this article is titled "Woman to Be Tried on Morphine Charge" (we are not told the date of the article or what newspaper it was published in). Not surprisingly, Goodwin says, "Somehow this is not what I expected." Nellie was 54 years old and had been caught with 1 1/2 ounces of morphine. Spillane says that the amount would be significant even today and is a good indication that she probably had it to sell, not to use herself. Goodwin assumes there were not a lot of female drug dealers. Spillane responds that women were overrepresented as addicts, particularly in the South, and he wouldn't be surprised if some of them also distributed the drugs. Goodwin wants to know if Spillane found any of Nellie's indictments after she was arrested, and indeed Spillane has more documents. The first is a letter from Nellie addressed to the U.S. Attorney's office in Shreveport and dated May 8, 1934. Nellie requested a transfer from the Shreveport to the Lake Charles Division so that she could enter a guilty plea and begin serving her sentence. She signed as Mrs. H. Wyllie. The second document was from the United States District Court, Western District of Louisiana. Mrs. Hugh Wyllie was sentenced to two years at the Federal Industrial Institution for Women in Alderson, West Virginia, starting from May 21, 1934. I found it interesting that in the newspaper article and in both legal documents, Nellie's given name did not appear. Goodwin wisely notes, "No wonder he didn't want us to know her name." But why did Nellie go back to Shreveport? Spillane says that in the early 1920's Shreveport was home to the nation's most significant clinic for narcotics addiction, and that records for the clinic still exist. Those documents are held at Louisiana State University, not too far from where they currently are in Shreveport. Spillane says that he can arrange for Goodwin to meet with Jim Baumohl, who can help her look through the material. Goodwin is silent for several seconds and looks as though she is thinking it over, then grudgingly says, "Well, I should go see them." I wonder if she would have gone if this hadn't been for a TV program. In this interlude, Goodwin looks serious and contemplative. She says she needs to learn if Nellie was an addict. She considers addiction to be a disease. If Nellie was an addict, maybe Goodwin's family won't be able to, but she can forgive Nellie. She doesn't want to say that she feels sorry for Nellie and doesn't think she should be pitied, but views her as someone to be understood. Still in Shreveport, Goodwin now goes to the Noel Memorial Library archives at LSU, where Jim Baumohl is waiting to help her. (Baumohl specializes in research into urban poverty, homelessness, and social welfare. We saw him previously on the Kelsey Grammer episode.) For obvious dramatic effect, he has her take a heavy book down instead of having it on a table already. It has the applications that people filled out when they wanted to come to the drug treatment clinic. Baumohl explains that Nellie was likely prescribed morphine during the first stage of syphilis for the pain. Baumohl adds that syphilis could not be cured until after World War II, when penicillin became available; during Nellie's time, doctors couldn't cure much but they could relieve pain. Nellie stated that she was married and had three children (we haven't heard about a third child; where did this one come from? ), and that she did want to be cured. Her address was 210 Baker. Goodwin pages through the book and comments on how many other women's applications are in it. Many of them apparently said they started taking the drugs after surgery. Baumohl says that medication addiction was ubiquitous in the South, particularly among women. Baumohl then tells Goodwin that the clinic for which these applications had been submitted closed in 1923. Nellie and Pearl would have been patients for less than a year. Goodwin notes that they really had no chance and wonders what would have happened if the clinic hadn't closed. Nellie probably would not have gone to federal prison. Baumohl also has an obituary for Nellie. The Minden Press reported on the funeral service for Mrs. Nellie Wyllie, who had died at the age of 82. Survivors included two sons, J. P. Wyllie (who must be that third child mentioned previously) and John B. Goodwin, and seven grandchildren, one of whom was Goodwin's father. (The complete text of the funeral notice appears on Nellie's FindAGrave page, which is linked below. I wonder who gave the information to the newspaper, since John was included.) Pearl apparently died before Nellie, but nothing was said about her death during the program. Maybe the researchers didn't find her? Maybe they didn't look? Goodwin talks about what Nellie faced was insurmountable. She was prescribed drugs then struggled with them, and that's probably why she was cut off by family. It was all a tragedy. Goodwin is excited to tell her father what she has learned but also (understandably) anxious about how he will deal with the information. Now that she's gone on this journey, she feels closer to Nellie. She's amazed that at the age of 37 she has "inherited" great-grandparents (though she never refers to Al as her great-grandfather). In the final scene, Goodwin visits Nellie's grave at the Minden cemetery and brings flowers. The gravestone has Nellie's and Hugh's names on it. (An interesting note per the FindAGrave page: Nellie outlived all three of her husbands. Also, her father's name is listed as Isaac Bart Haynes, not Will.) Goodwin tells Nellie, "You aren't Jewish, but I am" (Goodwin's mother is Jewish, and she was raised in both of her parents' religions), and she leaves a small rock on the gravestone, explaining that the Jewish custom is so that the deceased knows a loved one has visited. Goodwin regrets that there was no reconciliation between Nellie and John. She concedes that it was his right to feel the way he did, but it's still sad. She can't imagine facing everything Nellie did and not having a relationship with her own son because of it. Questions left unresolved in this episode: Who were the two women in the photo with Nellie? (Was the middle-aged woman Pearl? Maybe J. P. Wyllie's wife?) What happened to Duff Williams, Al Goodwin, and Pearl? You can find Duff's and Al's death dates on their FindAGrave pages, and Al's death certificate is posted, but Pearl isn't even listed as a child on Nellie's page. Inquiring minds want to know! As a side note, did you notice that all three of Nellie's husbands had trouble with the law? What does that say about Nellie? Whether deliberately or subconsciously, she appeared to make the same mistakes over and over. This was rather a downer of a story, and Goodwin is more than a little teary throughout. The research sources were interesting, but I was surprised that this was the lead episode for the summer season. It made me wonder what would follow in the ensuing episodes. 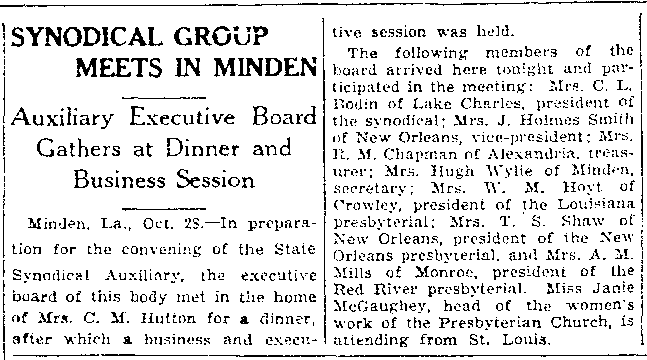 While this episode focused on the the negative aspects of Nellie's life, I did find two newspaper articles from her time in Minden, when she served on the annual Presbyterian synodical conference committee in 1930 and 1931. Apparently things weren't all bad all the time. In addition, both articles referred to her as Mrs. Hugh Wyllie, so apparently Spillane didn't do a very thorough search?